The PURE CPU Cooler is just another cooling system in CoolIt’s line of products that just keep making it easier for us all. 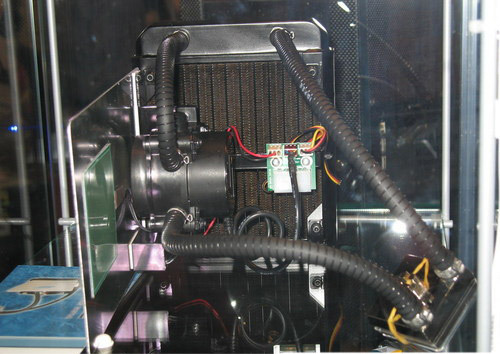 By using their patented system that combines air and water cooling, they just keeping upping the ante for efficient and user friendly cooling systems. The PURE system uses an environmentally friendly cooling liquid that actually absorbs heat more efficiently than air. In addition to that, it is incredibly easy to install. The universal sealed closed-loop maintenance free system is pre-plumbed and charged for simple bolt-in installation. By using this patented system, it eliminates the need for noisy case fans, so your ears will free of unwanted noise. In addition to cooling the CPU, it’s unique design allows the system to actually cool other components at the same time! The temperature will always remain low as the kit removes the heat from the source and removes it through the tubing out of the chassis.